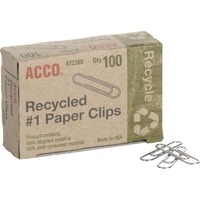 Recycled paper clips are made of 90% recycled materials, 50% of which is post consumer waste. Durable enough to keep their shape and be re used again and again. Smooth finish allows clips to glide easily on and off paper The 1 size clips hold up to 10 sheets. 100 per box.